Usually occur in our computers, both hardware and software trouble. And it is very hard to identify the trouble where the parts came to failure or damage. Such as the main hardware; motherboard, memory, or the video card itself if it is not shared to the motherboard, or the power supply unit that commonly we heard a high-pitched noise in the hard disk section and the cooler fan. But we need to identify it surely as we can, so that we can repair and change the damage parts as early because computer are part of our office work or a control system of a machine to perform a certain task. This is the purpose of this post, the paragraph below states how and where the trouble is both using our senses. Follow beep codes of any hardware trouble, the common beep codes trouble indicator is series of beeps that indicates memory failure and one lone followed by two short beeps indicates video card failure. Check the Hard disk if it is detected by the BIOS System, if it is detected proceed to check the start up and partition. This is probably cause by a corrupt or damage of the startup probably cause by a VIRUS or USER’s error. You need installer to try to repair the damage startup or restore the system. But you can try to F8 by safe mode the OS and uninstall the drivers software. Check the power supply output if there are damage Capacitor. Check that all fans are ok and working normal of rotation, you need to lubricate the fan. 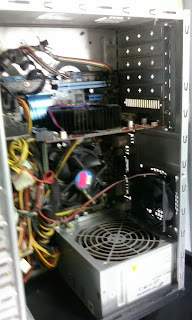 Check the dust build up inside the system unit. That’s all if you have any questions or any other trouble you encountered kindly message me using this page contact me I will try to answer your questions how to repair your unit. See you next post.